Model is scratch built with planks on frame method and painted as the real boat. Model comes with the display stand and ready for display. The gondola is a traditional, flat-bottomed Venetian rowing boat, well suited to the conditions of the Venetian Lagoon. For centuries gondolas were once the chief means of transportation and most common watercraft within Venice. In modern times the iconic boats still have a role in public transport in the city, serving as traghetti (ferries) over the Grand Canal. 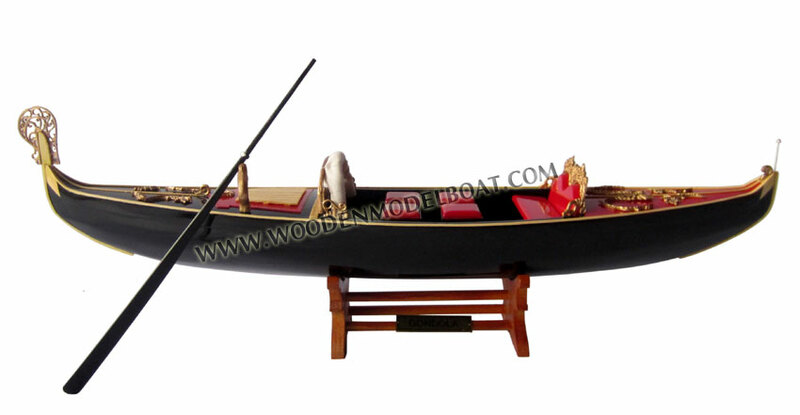 They are also used in special Regattas (rowing races) held amongst gondoliers. Their primary role, however, is to carry tourists on rides at established prices. Gondola showing use of oarThe gondola is propelled by a man (the gondolier) who stands facing the bow and rows with a forward stroke, followed by a compensating backward stroke. 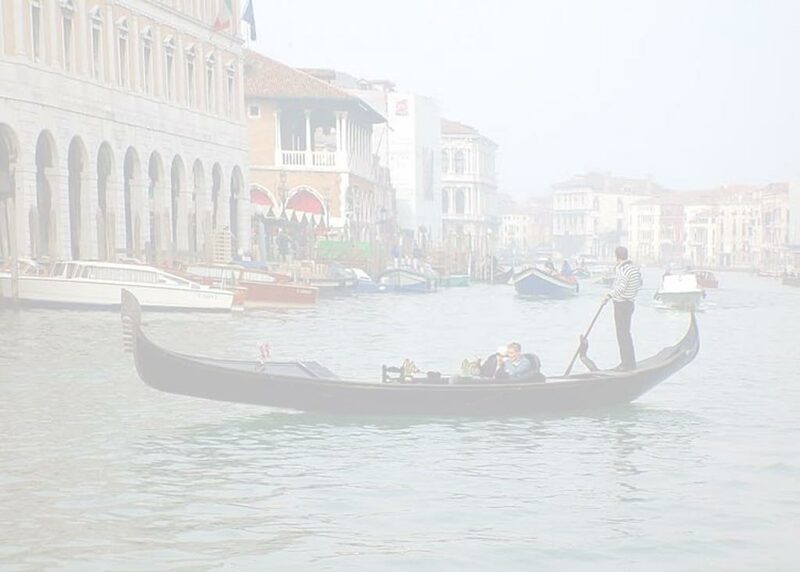 Contrary to popular belief, the gondola is never poled like a punt as the waters of Venice are too deep. Until about two hundred years ago, gondolas often were fitted with a "felze," a small open cabin, to protect the passengers from sun or rain. 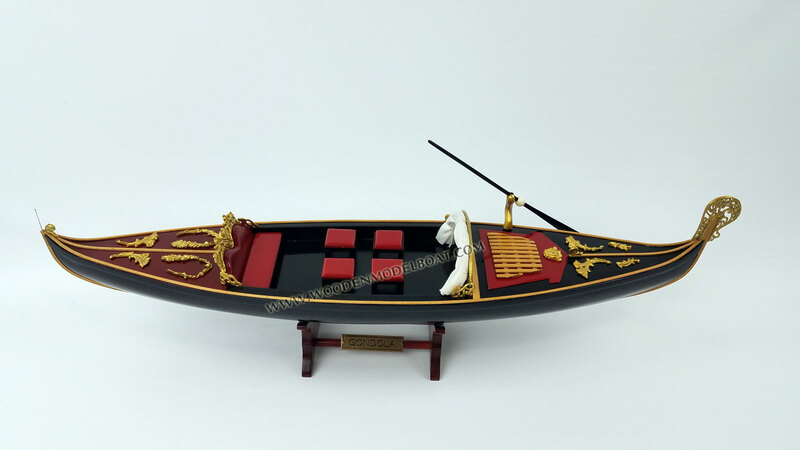 A sumptuary law of Venice required that gondolas should be painted black, and they are customarily so painted now. It is estimated that there were several thousand gondolas during the 18th century. There are several hundred today, most of which are for hire by tourists, while a few are in private ownership and use. 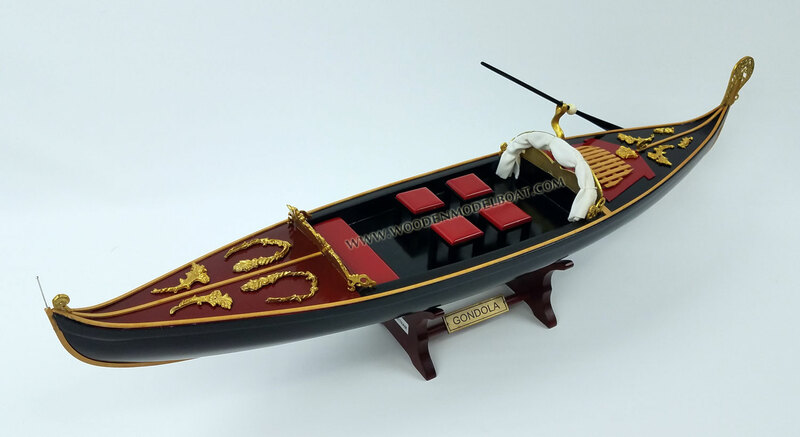 During their heyday as a means of public transports, teams of 4 men; 3 oarsmen and a 4th person, primarily shore based and responsible for the booking/administration of the gondola (Il Rosso Riserva), would share ownership of a gondola. However as the gondolas became more of a tourist attraction than a mode of public transport all but one of these cooperatives and their offices have closed. The category is now protected by the Institution for the Protection and Conservation of Gondolas and Gondoliers, headquartered in the historical center of Venice. The construction of the gondola continued to evolve until the mid-20th century, when the city government prohibited any further modifications. The oar or r�mo is held in an oar lock known as a f�rcola. The forcola is of a complicated shape, allowing several positions of the oar for slow forward rowing, powerful forward rowing, turning, slowing down, rowing backwards, and stopping. 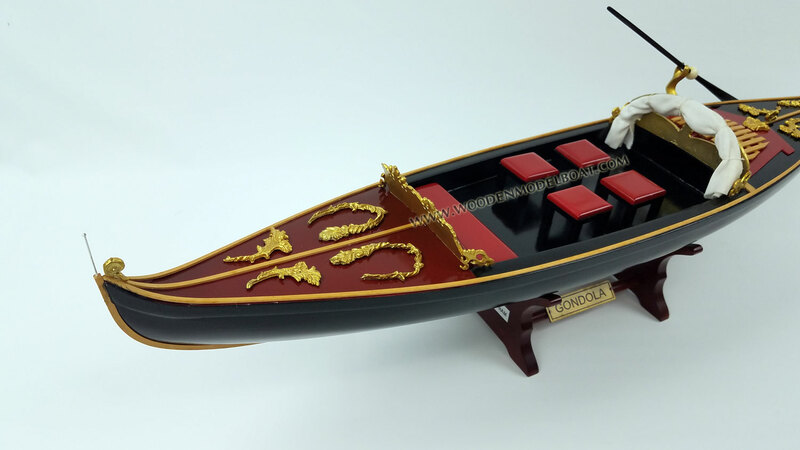 The ornament on the front of the boat is called the f�rro (meaning iron) and can be made from brass, stainless steel, or aluminium. It serves as decoration and as counterweight for the gondolier standing near the stern. Gondolas parking Gondolas are hand made using 8 different types of wood (fir, oak, cherry, walnut, elm, mahogany, larch and lime) and are composed of 280 pieces. The oars are made of beech wood. The left side of the gondola is made longer than the right side. This asymmetry causes the gondola to resist the tendency to turn toward the left at the forward stroke. It is a common misconception that the gondola is a paddled vessel when the correct term is rowed i.e. "I rowed my gondola to work". The profession of Gondolier is controlled by a Guild, which issues a limited number of licenses granted after periods of training and apprenticeship, and a major comprehensive exam which tests knowledge of Venetian history and landmarks, foreign language skills, and practical skills in handling the Gondola typically necessary in the tight spaces of Venetian canals. In 2009 a woman, Giorgia Boscolo, daughter of a gondolier, passed the first test to be admitted to the official course of training for substitute gondoliers; if she were to pass all the future tests, she would become the first female gondolier. The origin of the word "gondola" has never been satisfactorily established, despite many interesting theories.